The updated, reduced-tail-swing models are equipped with a powerful EPA Final Tier 4 (FT4)/EU Stage IV Isuzu engine complete with integrated, effective engine technologies and do not require a diesel particulate filter. Built with the same toughness as Hitachi’s large mining excavators, the ZX135US-6 and ZX245USLC-6 deliver higher efficiency, reliability and durability. The ZX135US-6 and ZX245USLC-6 take efficiency to a higher level with a hydraulic system that balances engine performance with hydraulic flow. The hydraulic boost system and enhanced boom recirculation generate aggressive boom and arm speed – returning the arm to dig faster, so operators can move more dirt in a day. The ZX245USLC-6 features a unique three-pump hydraulic system that provides even more flow. When demanded, the third pump supplies additional hydraulic oil to the swing circuit without stealing oil and speed from other functions in order to maximize productivity. These models also provide fuel-efficient performance with three work modes. High Productivity (H/P) delivers more power and faster hydraulic response. Power (PWR) delivers a balance of power and speed, plus fuel economy for normal operation. Economy (ECO) maximizes fuel efficiency while delivering an enhanced level of productivity. Auto-idle and auto-shutdown features contribute to fuel efficiency as well, and an easily accessible battery disconnect switch extends battery life. Both upgraded models come with complete standard factory installed auxiliary hydraulics with programmable attachment modes and proportional control to help improve productivity on the jobsite. The upgraded excavators feature a new, fuel-efficient FT4 Isuzu engine that is efficient and saves on service time. The Isuzu engines employ cooled exhaust gas recirculation (EGR), a diesel oxidation catalyst (DOC) and selective catalytic reduction (SCR). Diesel exhaust fluid (DEF) is injected into the exhaust stream of the engine, runs through a catalyst, and turns the NOx in the exhaust into harmless water vapour and nitrogen gas. The EGR is specifically tuned to further reduce NOx (compared to EPA Interim Tier 4 [IT4]/EU Stage IIIB engines) to meet new emission standards with minimal use of DEF. Additionally, an improved piston design allows particulate matter to be burned in cylinder, so there’s no need for a diesel particulate filter (DPF). In addition, the new pressurized fuel system improves fuel injector operation, and the fuel recirculation system helps prevent fuel gelling in cold climates. This makes it easier for operators to maintain maximum productivity. Both upgraded excavators feature unobstructed all-around visibility thanks to a wide expanse of front, side and overhead glass and mirrors, plus a standard rearview camera. Operators of the ZX135US-6 get maximum support from a sculpted mechanical suspension high-back seat. An air-suspension heated seat now comes standard for the ZX245USLC-6. In addition, an automatic, high-velocity bi-level climate-control system with automotive-style adjustable louvers helps keep the glass clear, the cab comfortable and the operator productive. D-channel side frames house and protect the highly efficient coolers and FT4 engine. Booms, arms and mainframes are so tough, they’re warranted for three years or 10,000 hours, whichever comes first. With large idlers, rollers and strutted track links, the sealed and lubricated undercarriage is built for the long haul. Maintenance is minimized with the ZX135US-6 and ZX245USLC-6. 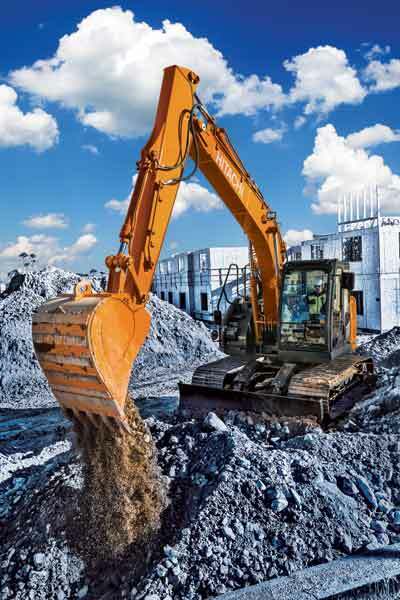 The excavators feature grouped service points; single-side ground-level filter service; at-a-glance gauges; and convenient, standard upperstructure handrails that provide easy engine access. Extended service intervals help maximize uptime, and scheduled maintenance is easy to track using Hitachi’s ZXLink system, which comes standard equipped on both models. ZXLink gives owners the power to optimize their operation and maximize profits. With the support of their dealer, owners can use their data to reduce idling time as well as maximize productivity and uptime. Without ever leaving their seat they have access to fleet location, functions, hours, fuel consumption, alerts and other essential machine data. Owners can also view location and alert information in the field from iOS or Android devices. An optional backfill blade for the ZX135US-6 adds stability and versatility, eliminating the need for another machine on the job. The ZX135US-6 also comes with an optional rubber pad that helps reduce damage when working on concrete or asphalt, and when crossing streets in residential developments. A variety of track widths, arm lengths and bucket sizes are available for both models.